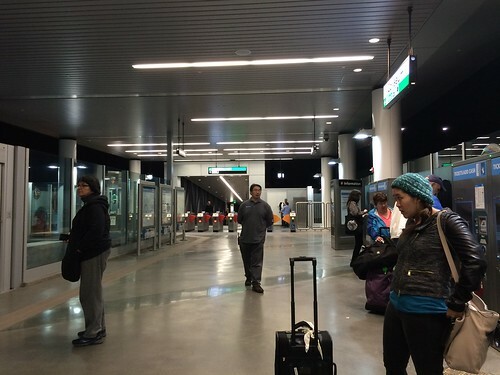 BART opened the new BART to OAK service on Saturday, November 22nd, in time for Thanksgiving travel this year. 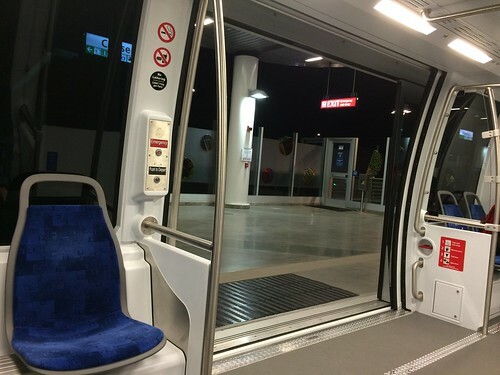 Basically it feels like an airport inter-terminal light rail/train type thing, like AirTrain at SFO or AeroTrain at IAD, only it operates between BART’s Coliseum station and OAK. I have no idea if it’s the same type of rail technology, just saying it feels the same. When you get off the BART at Coliseum station, you don’t even have to get off the platform. The Connector (I actually am not sure what they’re calling the service so I shall call it the Connector) is on one end of the platform — there are signs pointing towards it. Or you can just follow the people with the luggage; that’s what we did. 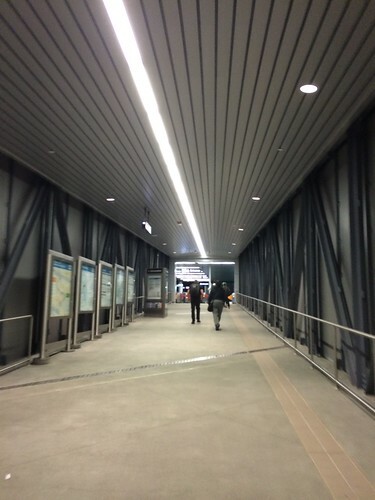 Then you cross like a covered pedestrian walkway/bridge to the Connector station. Where you exit the BART gates. There’s a $6 surcharge for exiting here, so the fare is however much it is to Coliseum station + $6. The old AirBART shuttle bus service was only $3, but the new service is nicer and faster, so I think it’s worth it. Nicer and faster as in it’s new and there weren’t lines and there was no traffic and whatnot issues. Then you wait on the platform — it was a pretty short wait for us, less than 5 minutes since we were in the peak 8am to 8pm time window. The ride took longer than I thought, perception-wise. It was shorter than the shuttle ride for sure, but there was a short stop in the middle of it — it happened on the way there and on the way back, so I guess it’s just a part of the trip. You’re not allowed to get off or anything but it does look like a spot where a maintenance or emergency crew could get on. I don’t know why the train has to stop at all; it wasn’t explained. Also the trip felt like it was winding around a bit. 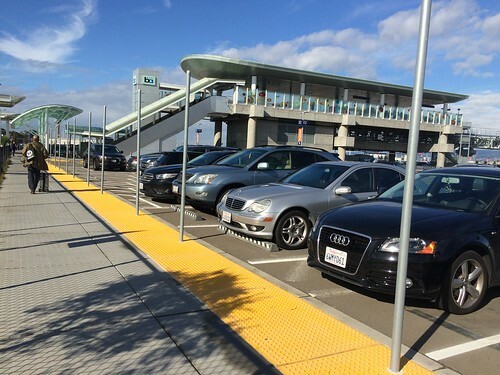 But then you get stopped off near the parking lot at Oakland Airport between Terminals 1 and 2. You have to cross lanes of traffic to get to the actual terminal, further out than the old location where the AirBART used to drop off. I wish they’d built it to just outside the terminals, but really it’s not a big deal. Just if they were going to build a whole new system, and you have to escalator down to the ground anyway, why not skip having pedestrians with luggage going across traffic? I don’t know. This is the view of the station on the way back. 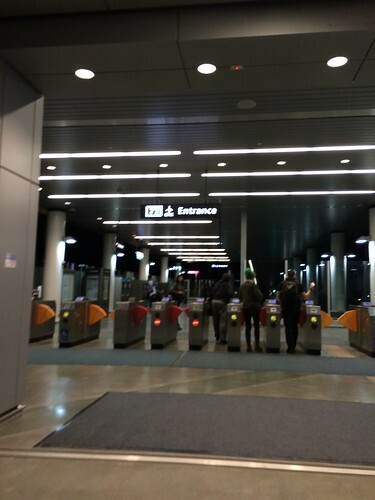 You get in and pay your fare and don’t need your BART or Clipper card until you get to your destination station. This is awesome! I kinda’ prefer OAK airport because it’s smaller but the buses made transportation there less predictable. This makes it much easier to time.